Depending on several factors — location, income, weather, day of the week, etc. — going fishing can mean different things to different anglers at different times. It can mean sneaking in a couple quick casts at the HOA pond before the first games on Sunday, or hitching up the Jon boat before heading to the boat launch for an all-day outing. Rarely does a piece of fishing tech meet needs across a spectrum this wide. 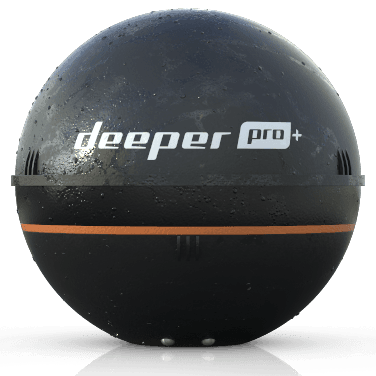 The Deeper Smart Sonar PRO+ (sometimes called the PRO Plus) bucks that trend. A high-end fish finder transducer in a robust package that can be boat mounted or cast from a heavy rod, the PRO+ transmits wirelessly via WiFi to the highest quality display the average angler already has: a smartphone or tablet. It works with iOS or Android, and its onboard GPS opens up a world of in-depth aquatic mapping with the company’s online Lakebook platform. The full package represents a real innovation for the portable fish finder category. Like roughly half the offerings in the class of mobile device-connected fish finders, the PRO+ uses WiFi to connect. The connection range comes in at a healthy 260 feet. Interestingly, the company recently lowered the listed maximum range from 330 feet. We’ve reached out to learn why, but haven’t yet heard back. The PRO+ features a dual-band sonar transducer. The first band pings at 90 kHz over a 55 degree sonar cone, good for scanning a large area to try to locate fish. Once located, the user can switch to a high powered sonar band pinging at 290 kHz over a narrow 15 degree cone. It’s the 290 kHz band that can reach a depth of 260 feet. Adding a GPS receiver to the transducer pod of the PRO+ means that the transducer now captures a stream of depth readings over a range of locations. GPS is combined onto mapping software to create a color-coded map of the bottom with bathymetry lines. Other fish finders in the class — Deeper’s lower models included — have relied on smartphone GPS to create maps, but built-in GPS is a first. Standard Mode – This is the basic fish finder 2D display. Boat Mode: In this mode, the PRO+ connects to the phone’s GPS system for ongoing tracking, enabling bathymetric mapping. Onshore GPS Mode: Here the PRO+ relies exclusively on its onboard GPS, instead of the angler’s presumably stationary phone, to generate map data. Classic color mode: This has a dark background, with multiple colors to designate different underwater debris interpreted in green to stand out separately from fish. Day color mode: This replaces the dark background with a high-contrast white background that looks more akin to classic fishfinder displays for use in bright sunlight. Night color mode: The display’s color palette has been reduced to a range of reds, going easy on the user’s night vision. The PRO+ has three threaded brass receptacles for the screw-in brass connection hardware, one each at the top, a quarter of the way down the curve of the body, and again just below the equator. Each attachment point represents a different application of the PRO+, be it fishing from shore, dock, or boat. In each case, the goal is to maintain the proper transducer orientation while reeling or on the move. Lakebook is Deeper’s cloud-based data platform for storing the bathymetric maps PRO+ users generate in either boat mode or shore fishing mode. Users have total access to their self-generated maps, and can go back and look up past fishing trips for specific dates, open and manipulate the maps, and add to incomplete maps. Lakebook’s data is exportable in its raw form, meaning anglers who already use separate mapping platforms can integrate Deeper’s data. Boat mount – Instead of just leaving the user to troll the PRO+ transducer behind the boat or come up with a jerry-rigged solution of their own, Deeper offers its Flexible Arm Mount accessory. Consisting of a clamp with a flexible arm with standard ¼’-20 screw-in attachments, the mount enables the user to affix the Deeper transducer directly to the boat with an included safety lanyard as backup. The standard screw sizing makes it compatible with any boat accessory track system. Night Fishing Cover – The user can replace the standard black cover with a translucent orange cover that allows a flashing LED light in the transducer to be clearly seen during low light conditions. The aspect of the PRO+ that jumps out first is its adaptability. Its features, both hardware and software, very amply address the needs of a range of anglers. The onshore GPS mode and the mid and low fishing line attachment point more than meet the castable fish finder use case for the shore or pier fisherman. The addition of Lakebook upgrades this experience, turning what could be a novelty into a value-added knowledge base for the detail-oriented angler. When it comes time to go out on the water, changing over the easy-to-use flexible arm mount accessory mean the shore angler switching to a boat can quickly unscrew the brass fitting, move it to the transducer’s top position, and be on his or her way. The maximum depth of 260 feet is pretty astounding, and will do the job for everything but true deep-sea fishing. From an overall quality standpoint, the PRO+ is simply unmatched in the category. Physical build quality — right down to the packaging and instructions — is close on par with the best consumer electronics from Silicon Valley. Physically, the PRO+ feels well-made, right down to the markings that indicate the watertight seal. The three attachment points are very heavy duty compared to those of the rest of the category. The PRO+ charges with a micro-USB cable, a standardization choice that’s surprisingly uncommon for the category and points to a realistic approach by its designers. That build quality extends to the software coding. The Fishfinder app and Lakebook online UI are just plain well done, with user interfaces that rival those of high-end fish finders with integrated displays. The package feels like a mature tech suite out of Silicon Valley, which is not entirely unsurprising for a company headquartered in Lithuania. The Lakebook function really stands out in the category. Even on a day the fish aren’t biting, the average user can explore a new lake or pond and come away with something of lasting value: an understanding of the bottom structure. Add to that the ability to retrieve and add to existing maps, and to import and export data, and Deeper is onto something. A next step for Deeper would be to really open up the Lakebook platform in a social media sense, enabling anglers to share maps and other details. Deeper is staffed with smart folks – it wouldn’t be surprising to see this appear as an upgrade in the coming years. That said, recently Deeper has branched out into smart bicycle locks, so the company may be going after a wider product strategy instead of reinvesting in fishing mapping. The PRO+ represents the top of Deeper’s line of castable fish finders, and shares much of the technology of the next-highest offering, the PRO. Both models share the ability to do boat-based bathymetric mapping that relies on a smartphone’s GPS, but only the PRO+ offers the shore-based GPS mode. Both versions add WiFi to the company’s base model, the Smart Sonar 3.0, greatly extending the transmission range, as well as advanced sonar, allowing to unit to sound in deeper water. Read our Deeper Smart Sonar 3.0 Review. The closest competitor to the PRO+ comes in the form of the FishHunter Directional 3D Wireless. FishHunter’s offering shares the PRO+’s WiFi transmitter but advertises a range of 200 feet, 60 feet shorter than the PRO+. Its sounding depth is also 160 feet, 100 feet less than the PRO+. FishHunter’s top-of-the-line model also adds some interesting 3D depictions of the underwater environment. Another competitor often compared to the PRO+ is ReelSonar’s iBobber, representing much lower entry point to the category. The iBobber relies on Bluetooth for transmission, and has a much more basic sonar; together they add up to significantly lower range and depth than the PRO+. That lower tech approach does come with a benefit: the average angler is much less apt to worry about losing a cheaper product. The Deeper Smart Sonar PRO+ in many ways is creating a category. With rock-solid engineering and backed by well-crafted software, it’s almost a surprise that the PRO+ comes in a portable, castable package. Put together, it’s no wonder the most common concern buyers have is losing track of their transducers.